Nafset Chenib dreams of attending school in New York City. Listen to more about her dream, challenges and experience growing up in russia…but you especially, have to hear her voice! And make sure you stay tuned for the Reid My Mind Radio Theme Re-Mix! – Or hit the Play button below! You’re listening to Nafset Chenib, a 28 year old soprano born in Southern Russia. Now I live in Moscow. I have studied hear for five years and then I decided to stay here cause I love this city and from my point of view it’s much easier to live in the big city when you are blind rather than a small town. At 6 years old Nafset began attending a Russian boarding school for blind children. Unfortunately we had no choice . We didn’t have any opportunity for a inclusive education. So I was forced to be there at the boarding school – it was quite far from my house. While she says she received a good education, Nafset believes not all of the components that make up the educational plan are fulfilled. Meaning both academic and social including daily living skills. There are a lot of teachers that don’t know Braille in those special schools. From my experience I wasn’t taught to use the cane. when she and her class mates wanted to learn the English language like children outside of boarding schools. You know it was quite offensive. Ironically Nafset would come to not only learn English, but several foreign languages. I’m not Russian. I’m Sarcasian so I can speak this Sarcasian language it’s called Adyghe language. I speak Russian. I speak Italian. Now I try to study German, mainly because of music. Go ahead and add her ability to sing in Hebrew, Czechoslovakian and Spanish. While the boarding school may have not imagined blind Russian students having a need for learning English, they did have a music school that would introduce Nafset to her passion. I finished my musical school as a pianist. But I had supplementary discipline. It was vocal, opera singing. I started to participate in different festivals to sing in different choirs. I participated in the festival when there was the great opera singer Montserrat Caballé. Among other notable experiences, add the time she sang for Pope John Paul the second! I was able to visit Covent Garden Opera. They performed Semele by Handel and I was so impressed that I decided to go in for music more seriously. Taking her dream seriously, Nafset had to fill one of the components that wasn’t addressed in the school for the blind. She decided to find an orientation and mobility trainer to learn how to use the white cane in order to better travel independently. Now able to make her own life decisions, Nafset chose to pursue her college education in an inclusive environment, even though there is a special musical college for the blind. After college I decided to pursue my education in Moscow. I studied at Victor Popov Academy of Choral Arts. It was wonderful time. I sing solo; students choir. I was able to collaborate with very interesting orchestras, outstanding conductors. In some respects, a vocation as a singer seems like a natural fit for a talented person who is blind. The misperceptions about blindness aren’t very logical and are more about the beholder’s limitations rather than the person who is blind. Outright denying the existence of people with disabilities in the country. many teachers are still against creating an inclusive educational environment for children with disabilities. While Nafset recognizes the areas for improvement, she’s very clear about her love of her country and wants to be a part of the solution. I see that we have a lot to adopt from the United States. I’m eager to do that. Going after your dreams isn’t easy! Most artistic endeavors require a great deal of practice and of course you need to make a living. I work at the Moscow Art Theater. I sing for one performance. I like my job. It’s like a miracle for me. but she remains committed to her dream. So what exactly is stopping Nafset from pursuing her dream? In February, I had a successful audition at Manhattan School of Music in New York And I was accepted and I have been granted scholarship it amounted to 15 thousand dollars, but the whole tuition fees 45 thousand dollars so I think I’m not able to pursue my education in USA. I have not a bad education here in Russia but for me self-development is the main thing in my life. I want to develop myself. Sometimes it’s helpful to think about our past successes to provide encouragement and remind us that we can prevail. 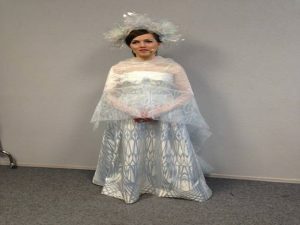 In 2014 During the closing ceremony of the Paralympics in Sochi, Russia, Nafset was the soloist in the closing act. It was just a great honor for me! I was so glad to sing there …stadium included 40 thousand people. The show was televised as well. Making her entrance , Nafset is on a platform which rises above the rest of the entertainers and participants on the field. The Olympic torch is extinguished as Nafset holds her final note! It’s unforgettable experience for me! Maybe I am an Idealist but it’s my dream. You continue to follow your dream! Maybe her entrance during the Sochi performance is symbolic of things to come. Nafset rising above all – perhaps all of the obstacles on her path toward fulfilling her dream. Her passion represented by the fire can only be extinguished by Nafset herself. You have to respect anyone pursuing their dream. Especially those who can still find time for gratitude when things don’t seem to be going as they wish. I just want to say I’m very happy to have the experience in United States. Today I can tell the people here in Russia about the things that we don’t have here but you have there in the United States. I’m very thankful to all the American companies who work out the software and different technical devices to improve our lives. I really feel very thankful. This is Thomas Reid, . Thomas usually concludes with some silly self-effacing close! If you’re listening to this via the podcast or Sound Cloud and want to check out the YouTube video or link to Nafset’s Go Fund Me, go on over to Reid My Mind.com where I have all the links. One of the things I always loved and miss about living and working in New York City is the variety of people. Among most of my friends and family, I’m one of the only people who didn’t mind riding the subway. I loved people watching and the occasional spontaneous conversations that either I would be a part of or have the chance to overhear or basically ease drop. Interviewing different people for me brings back a similar feeling. Especially speaking with those I’d otherwise never have a chance to randomly meet. Like those in a different country from other cultures sharing their experience. You just listened to two people from very different back grounds in countries that were once the greatest enemies. I guess I’m old enough where I still am amazed and appreciate the technology involved in making this conversation possible. The conversation itself took place on our iPhones via Face time Audio. was believed to be a poor reflection of the future of accessibility for those who are blind. I’m still impressed that our Wi-Fi connection held up as packets of information were sent back and forth from the Poconos in Pennsylvania, USA to Moscow in Russia. Maybe it’s just my level of Geekiness that thinks that stuff is still pretty cool! And Nafset , reminds me to continue to be thankful! Posted by T.Reid	on Jun 29th, 2016	and is filed under Audio, Blindness, Goals.